Pukhov: "Pogosyan is a synonym of research and development, so there will be no problems with innovations." Sukhoi Holding chief executive Mikhail Pogosyan's appointment as head of theUnited Aircraft Corporation will make him de-facto leader of the entire domestic aircraft industry, in what analysts see as a positive change for the market. Pogosyan's appointment may facilitate the restructuring of the United Aircraft Corporation, which is expected to be completed next year, said Andrei Rozhkov, a transportation analyst at Metropol. The new director may try to reduce rivalry between Sukhoi Holding and Irku — the two jet-making divisions inside the corporation. “If Pogosyan signs a long-term contract and gets carte blanche, it's quite possible that restructuring will be completed quickly,” Rozhkov told The Moscow Times, adding that domestic jet makers should join forces to compete successfully with international rivals. The corporation's board of directors approved a restructuring plan in June that will result in the company being divided into three integrated units in charge of constructing fighter jets, civilian aircraft and special-purpose aircraft by 2012. Pogosyan is a professional aircraft designer who inherited the traditions of the Soviet school and of good management, said Ruslan Pukhov, director of the Center for Analysis of Strategies and Technologies. 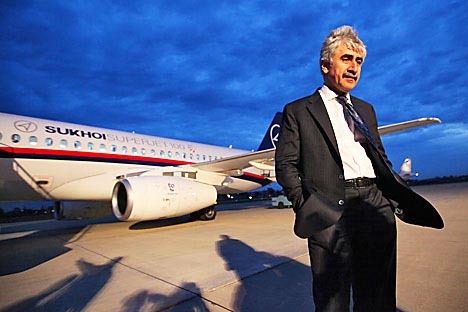 Having graduated from the Moscow Aviation Institute, Pogosyan started working at Sukhoi as an engineer and was appointed chief executive in 1999. In 2007, he was appointed a first vice president of the United Aircraft Corporation and became chief executive of fighter jet maker MiG two years later. President Dmitry Medvedev fired head of the United Aircraft Corporation Alexei Fyodorov on Monday for failing to allocate appropriate funding for research and development programs. The decision was announced after a meeting of his Modernization Commission. Presidential economic aide Arkady Dvorkovich said Pogosyan would replace Fyodorov as head of the United Aircraft Corporation, adding that Pogosyan's candidacy will be approved at the corporation's next board meeting. Fyodorov's dismissal may result in a cut in government funding for the industry. “Fyodorov successfully lobbied the government for the industry's interest, which resulted in big subsidies and decisions beneficial to the corporation,” Rozhkov said. According to the Industry and Trade Ministry, the government allotted a total of 130 billion rubles ($4.33 billion) to support the aircraft industry during the economic crisis. Pukhov said Pogosyan's appointment has international significance as well. He is likely to be successful overseeing a number of Russian projects with foreign partners, including the T-50 fighter jet, a joint project with India. “Pogosyan is a synonym of research and development, so there will be no problems with innovations,” he said. A spokesman for the United Aircraft Corporation declined to comment on the issue. But a source close to the company said United Aircraft Corporation hadn’t been officially informed of the staff changes. Pogosyan's appointment isn't included in the agenda of the corporation's board meeting, which is scheduled for Thursday, the source said, adding, however, that the agenda can be adjusted.